Visiting the United Kingdom and Ireland is a very accessible trip from my home in Arlington, Virginia. A 7-hour direct flight to an English-speaking nation seems easy and comfortable, but yet I had never been to this part of Europe. Two friends and I decided to go, but it was difficult choosing which areas we wanted to spend our time in. In the end, we chose to get a small taste of three different countries and four cities, whichever we like best, we'll have to plan a visit to go back! If you're looking for a possible itinerary, the information below might help with your planning! 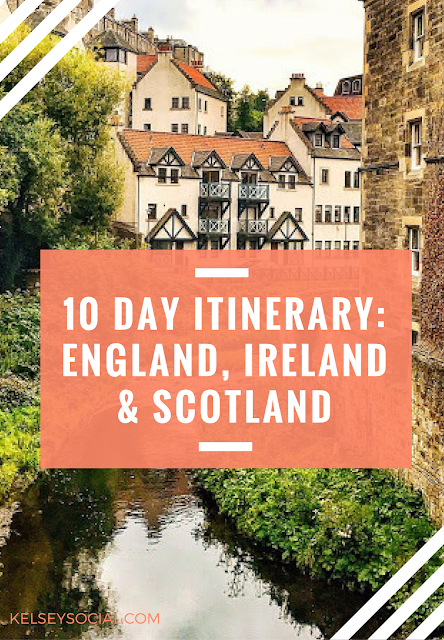 I'm sharing how I spent my ten days (including travel days) starting in London and stopping in Edinburgh before making it over to Ireland. I traveled Thursday evening until Saturday evening so I only needed take six days off of work. After a full day of work, I left in the evening from Washington National Airport (DCA) to fly to London Heathrow Airport. Arrived at Heathrow in the morning and met two friends. We checked into the Trafalgar Square St. James hotel then wandered around the city to see Big Ben, The London Eye, Trafalgar Square, and Buckingham Palace. We got drinks on Carnaby Street and had dinner in Kingly Court. Brunch at Sketch for the whimsical atmosphere (and must-see pod bathroom) followed by a walk along the River Thames with views of Tower Bridge. Worked up an appetite during the walk in order to get fish 'n chips and Pimm's Cups at Borough Market. Admired the colorful houses of the Primrose Hill neighborhood and grabbed a pint at a local pub before climbing the hill for sunset. Went to Notting Hill to check out the shops and eat brunch at Farm Girl. Wandered around the neighborhood and stumbled upon Rainbow Row. Took the tube to Shoreditch in search of street art and a lively atmosphere. Flew to Edinburgh from Gatwick Airport with British Airways in the evening. In Edinburgh, we stayed near the Royal Mile in this AirBnb. Grabbed a quick coffee and hiked Arthur's Pass in the morning. It was a little more strenuous than expected and we rewarded ourselves with a traditional Scottish Breakfast afterward. Walked the Royal Mile and bought some souvenirs in the afternoon. Dinner at Monteith’s. Drinks at The World's End. Walked towards Edinburgh Castle stopping at The Auld Hoose for good coffee and an enormous plate of vegan nachos. Saw the outside of the castle, but opted out of buying tickets and walked to Dean's Village instead. Then, took an Uber to Craigmillar Castle and had the place practically to ourselves. Flew from Edinburgh to Shannon, Ireland on Aer Lingus in the morning. Picked up a rental car at the airport and drove to the Cliffs of Moher. After visiting the Cliffs, we stopped for lunch in the small town of Lisdoonvarna and then drove along the (narrow, windy, a little scary) Wild Atlantic Way to get to Galway. We stayed at The Western Hotel in Galway. Spent the morning in Galway. Ate brunch at the amazing Ard Bia at Nimmo's. Rainy/windy weather wasn't too inviting so we left Galway a little early to drive to Dublin. Dropped off the rental car at Dublin airport and took a taxi to downtown Dublin. We stayed at the Temple Bar Apartments - it was nice to have a washer and dryer in the apartment building to do laundry and travel home with clean clothes! We explored the lively Temple Bar neighborhood and grabbed delicious cocktails and dinner at The Bull and Castle. Breakfast at The Queen of Tarts. Toured the Guinness Storehouse - a must-visit in Dublin. The experience was better than I had expected and the rooftop bar has the best view of the city! Saw the Trinity College Campus and picnicked at St. Stephens Green with treats from The Rolling Donut. Dinner at The Winding Stair. Another stop at The Queen of Tarts for coffee and scones before taking an Uber to Dublin Airport for a morning flight home to Washington, D.C. I hope this itinerary helps in your planning or inspires you to travel somewhere new! Please let me know what places I missed and where I should go on my next visit to England, Ireland or Scotland!